Also huge—EarlyLearnNYC, the City’s massive subsidized early education system, will move from its current home at the Administration for Children’s Services (ACS) to the City’s Department of Education (DOE). Views on how these developments will impact the over 30,000 babies, toddlers and preschoolers enrolled in EarlyLearn’s sprawling portfolio of daycare centers, Head Start programs, pre-k programs and home-based family child care vary depending on who you talk to. Will the new plans further disrupt a child care system still reeling from challenges that arose from pre-K expansion, including a roughly 20 percent decline in enrollment of 4-year-olds since the expansion? Or might they, as a report recently released by the New York City Independent Budget Office suggests, present a key opportunity for the DOE to identify and address those challenges? There are many facets of the City’s subsidized child care system that will be new to the DOE—the family casework piece intrinsic in subsidized child care, for instance, and the task of training the hundreds of women who look after infants and toddlers in their homes as part of EarlyLearn. But in theory, the DOE seems a natural home for a diverse range of programs that share the common goal of preparing young children for school. But the DOE already leans heavily on child care centers to house many of its pre-kindergarten classrooms. (See chart, “Where the Pre-K Seats Are,” below.) Directors of some of these programs say that two crippling side effects of universal pre-K—attrition of child care center teachers and of children enrolled at the centers—have so far remain unaddressed. In some cases, they have even been exacerbated by the education department’s policies and practices. If 3-K-For-All is to succeed—meaning that it is fully funded and brought to scale to serve over 60,000 children—child care centers will be an essential part of its capacity. 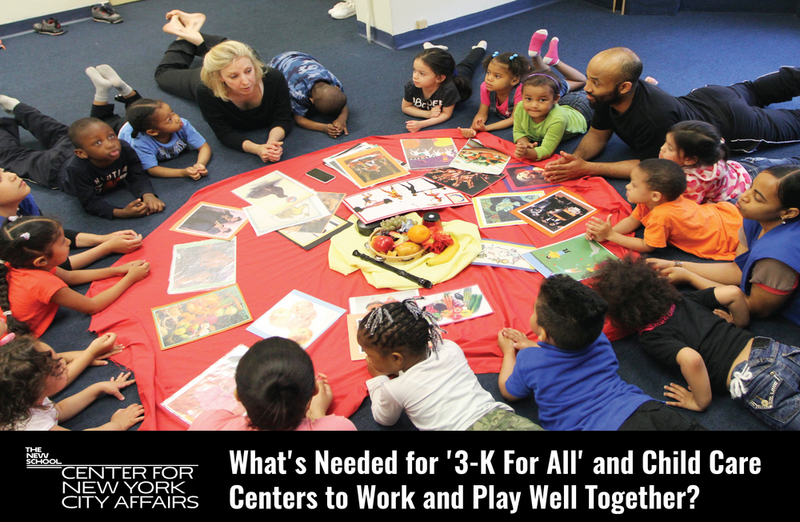 Directors at many centers caution that in the planning of 3-K-For-All, the major shifts in staff and children they have experienced since UPK expansion must be acknowledged and addressed or these vulnerable services will be in peril. The first issue—teacher attrition—has received much attention. The Center for New York City Affairs first raised the issue just before UPK expansion occurred. And last month, The New York Times reported that even after EarlyLearn teachers received their first raise in over nine years, certified UPK teachers in EarlyLearn programs work more hours and make less money—sometimes tens of thousands of dollars less annually—than they would if they took the same job in a public school or standalone pre-K center, where the teachers belong to a different union. Moreover, DOE pre-K teachers also work fewer hours to earn their higher salaries. EarlyLearn programs run year-round for eight to 10 hours a day and are open during school holidays. Pre-kindergartens in the schools close during summer and have shorter hours of operation during the school year: six hours and 20 minutes a day. Less talked about is how UPK expansion has also hit enrollment at the privately run centers. This has left some EarlyLearn pre-K programs severely under-enrolled or in constant flux, and the centers struggling to adjust their budgets. Data provided by ACS show that since the City’s expansion of UPK programs in September 2014, enrollment in EarlyLearn programs of children eligible for UPK (4-year-olds or those about to turn 4) has decreased by nearly 20 percent—from 12,269 in January 2014 to 10,073 in January 2017. One reason: What’s a bane for EarlyLearn administrators is a boon for families eligible for their services, because they now have more choices for where to enroll their 4-year-olds, including at child care centers, public schools or the DOE’s standalone pre-K centers. In this competition for 4-years-olds, UPK programs housed in schools and DOE-run standalone pre-K centers have some key advantages over EarlyLearn programs, starting with the perception that because their teachers are paid better and the programs are housed in schools and don’t have to spend money on, say, rent, they are stronger, better-resourced programs. Also significant for parents, the DOE’s eligibility requirement for pre-K programs is simple—it asks only that children be born during a specified year. EarlyLearn and Head Start programs, on the other hand, have stringent income eligibility requirements, reducing the pool of families they can recruit from. Moreover, EarlyLearn programs require enrolling families to produce much more paperwork to register—a complicated and sometimes lengthy process. When it comes to recruiting families to UPK, the DOE also has had the advantage of being able to see information about where UPK-eligible children are enrolled and waitlisted. Multiple directors of community-based organizations say that DOE representatives have called families enrolled or waitlisted in early education programs to offer them seats at under-enrolled DOE schools and pre-K centers. “It seems like a competition between the community-based organizations and New York City,” says Asneth Council, director of child care at the Police Athletic League, which has six early childhood centers in Brooklyn and Queens. The private centers, on the other hand, have no access to such waitlists. One result is that some EarlyLearn programs will believe in August that they are fully enrolled for 4-year-olds, only to find out after Labor Day that many students have, in fact, moved to other programs. Ever since UPK expansion, when it comes to enrollment each year “has been a kind of a whipsaw,” says Ken Jockers, executive director of Hudson Guild, a community agency that runs several early childhood programs in Manhattan, including Head Start, UPK and EarlyLearn classes. Before UPK expansion, Hudson Guild relied on about 90 percent of their 3-year-olds moving on to their classrooms for 4-year-olds; now that retention rate is only about 60 percent. LeAnn Scaduto, deputy executive director at Hudson Guild, says that she and her colleagues now must spend far more time and energy recruiting and retaining kids for these classes, which plays havoc with classroom planning. Even if their classrooms are filled, early education centers may encounter yet another obstacle to stability: part-time students. Most early education centers are built on a business model that assumes children will be enrolled 12 months a year for 8-10 hours a day, not the 10 months for a little over six hours a day of DOE pre-K. But DOE policy prevents center directors from picking and choosing only those children who need full-day or full-year care. This means that for each UPK child who does not bring in money for summers or for a full day of child care, the centers lose money. Three years into Pre-K for All, many EarlyLearn centers are still struggling to adjust to these changes. Some have decided that even if it is against DOE policy, they will do everything possible to take only those kids from their waitlists who need a full day and full year of care. Others have moved into survival mode and transferred resources away from the classrooms and into teacher and student recruitment. Deciding it is simply too difficult to enroll as many 4-year-olds as before UPK, others have turned their attention to enrolling more 3-year-olds. The percentage of 3-year-olds, enrolled in EarlyLearn programs, has increased 11 percent since UPK expansion — from 10,582 in January 2014 to 11,727 in January 2017. Converting an empty 4-year-old classroom into one for 3-year-olds is a relatively easy transition, since staffing and permit requirements are the same for both age groups. However, 3-year-olds cannot easily be brought in to fill empty seats in a semi-full UPK room. So converting UPK classes into ones for 3-year-olds has ended up being an option primarily for large organizations with multiple locations who either have extra space or are able to create it by combining under-enrolled pre-K classes. As DOE moves into serving 3-year-olds, some centers worry they will see a drop in enrollment of 3-year-olds, and are considering serving even younger children. But while there is a great demand for more infant and toddler care in centers, converting a preschool classroom to one suited for babies is difficult and expensive; it requires a different permit and, along with that, different space and staffing requirements, including a lower child-to-teacher ratio. In a proactive move, ACS has begun a pilot project to convert some of its EarlyLearn Head Start classrooms for 3- and 4-year olds to Early Head Start slots for infants and toddlers, which, in the world of child care, are considered to be generously funded. For 3-K to be brought to scale, directors say, it will be essential that DOE also do things differently. In the best-case scenario, directors say, with the DOE as EarlyLearn’s new home, the education department will embrace the centers’ challenges as their own, and become an advocate for subsidized child care, taking on the thorny issue of salary disparity among teachers and setting up equitable and sustainable systems for recruiting and retaining students. This brief is made possible thanks to the generous support of Early Childhood Partners NYC.